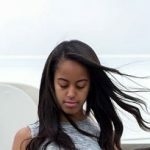 Q: Was Malia Obama arrested for attacking an elderly white woman? Did the arresting police officer mysteriously die? A: No. Those false stories originated on websites that claim to publish satire.